Ukraine earned a 1-0 win at home to Slovakia in Group B1 thanks to an 80th-minute penalty from West Ham's Andriy Yarmolenko. In Group D1, Georgia also struck late as a 77th-minute penalty from Tornike Okriashvili finally broke Latvia's resistance to earn a 1-0 win for the hosts. Bulgaria were 1-0 winners at home, Radoslav Vasilev's second-half goal seeing off 10-man Norway, who lost Haavard Nordtveit to a second yellow card in the 88th minute of the Group C3 match. In the same group, Petar Stojanovic's own goal in the 89th minute earned Cyprus a 2-1 home win over Slovenia. Robert Beric had put the visitors in front before Pieros Sotiriou levelled in Nicosia. Leeds forward Ezgjan Alioski scored a penalty and Goran Pandev was on target in a 2-0 Group D4 win for Macedonia over Armenia. In the same group, Liechtenstein won 2-0 at home to Gibraltar thanks to goals from Dennis Salanovic and Sandro Wieser. Wales were brought back down to earth following their 4-1 thrashing of the Republic of Ireland as Denmark, back at full strength, cruised to a 2-0 win in Aarhus. Christian Eriksen, one of the senior players to return to the squad following the resolution of the players' image rights row, which had led to a team of lower-league and futsal players taking to the field in the 3-0 friendly defeat to Slovakia on Wednesday, was on target twice in the Group B4 clash. He produced a smart low finish off the side of a post in the 32nd minute and sealed the victory with a 63rd-minute penalty after Ethan Ampadu was harshly adjudged to have handled Viktor Fischer's cross. Olivier Giroud's thumping volley earned world champions France a 2-1 win over the Netherlands at the Stade de France. The Chelsea striker, who failed to score during the World Cup in Russia, met Benjamin Mendy's left-wing cross with a fierce first-time finish in the 75th-minute. Jasper Cillessen in the Holland goal got a hand to the shot, but could not keep it out as Didier Deschamps' men won for the first time in Group A1. 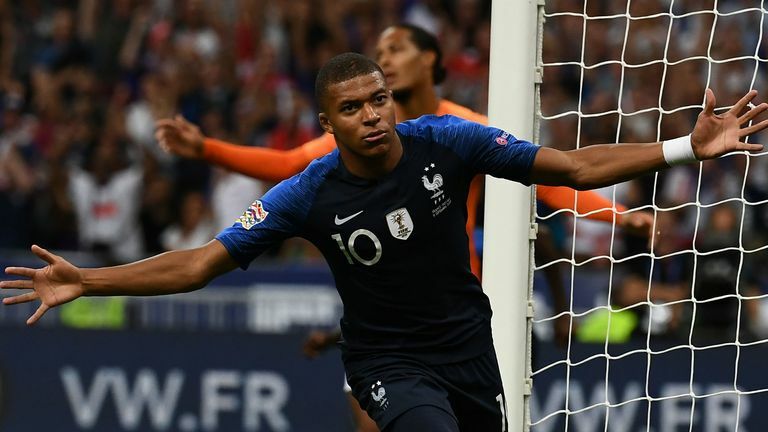 Kylian Mbappe, one of the stars of the World Cup triumph, set France on their way after 14 minutes, tapping home at the far post from a Blaise Matuidi cross after Quincy Promes' horribly misplaced header had sent the Juventus man clear. But Holland stunned the home fans in the 67th minute when, moments after Georginio Wijnaldum dragged a glorious chance wide, Ryan Babel poked home a pin-point low cross.